Is Dozer a dangerous dog? Must Dozer be contained, leashed and muzzled? The Chief of Police says yes, the owner says no, and the Brattleboro Selectboard will get to decide at their next regular meeting on Tuesday. The DPW will begin looking at options for improvements to their facilities on Fairground Road, the shiny discs on the parking garage will become a permanent installation, SeVEDS will review their year and ask for money, the Assessor’s Office will talk FY20 budget, and the board will approve some grants. You can bring up other items, of course, during public participation. 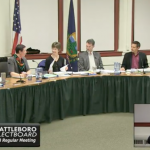 The Brattleboro Selectboard will hold a special meeting on Tuesday, November 27, 2018 at 6:15pm in the Selectboard Meeting Room at the Municipal Center. ASL interpreters will be available for deaf and hard-of-hearing community members. On behalf of Public Works, I was able to take a few aerial views of Lester Powers’ funeral procession earlier today. Lester served the town for 50 years from 1945 to 1995 and operated a road grader for the majority of that time. As such, Mr. Powers’ family requested one to lead the procession. A new Brattleboro ordinance for Uber and Lyft types of vehicles for hire will get a First Reading at the next meeting of the Selectboard. There are also changes to parking in front of the Boys and Girls Club to be discussed. The board will hear about changes to Brattleboro’s bus routes, the Fire Department will recieve an award, multiple dump trucks will be purchased, a bridge will be scheduled for repair, and odors shall be tested. You can also bring up other items or smells not already on the agenda during Public Participation.